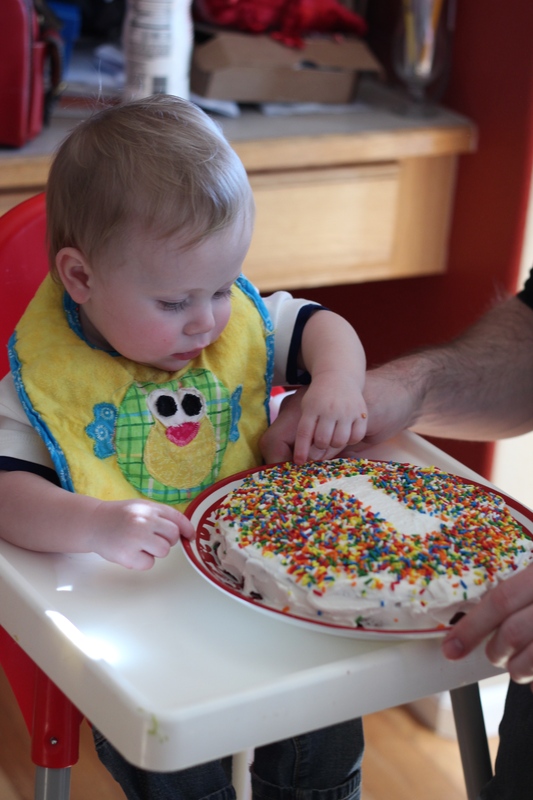 On Saturday, we celebrated Jonathan’s First Birthday. 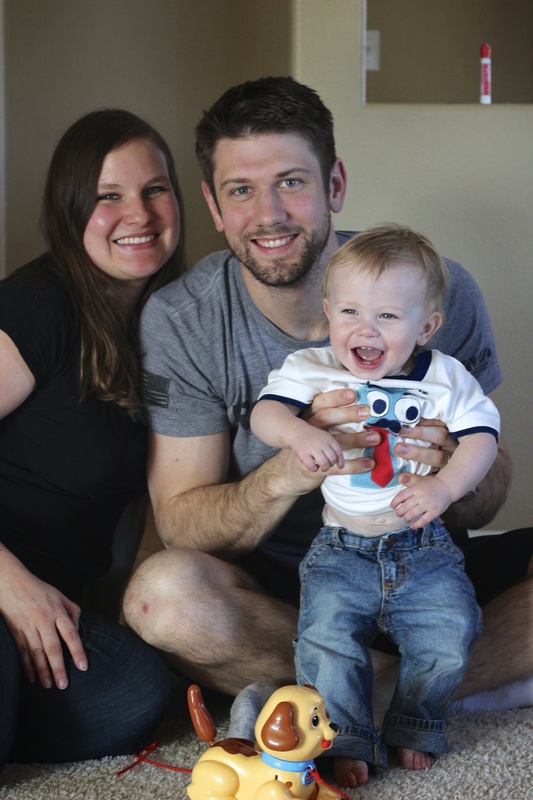 It’s amazing to me that it has already been a year since our precious boy was born and brought so much joy to our lives. His birth and the following days still feel so fresh in my mind, as does the feeling of overwhelming love that flooded the room when he was placed on my chest. We did not know until 8:54am on Friday, January 17, 2014 that the baby we had been waiting for, that I had been carrying and whose body was knit together in my womb for the last 39 weeks was a boy. 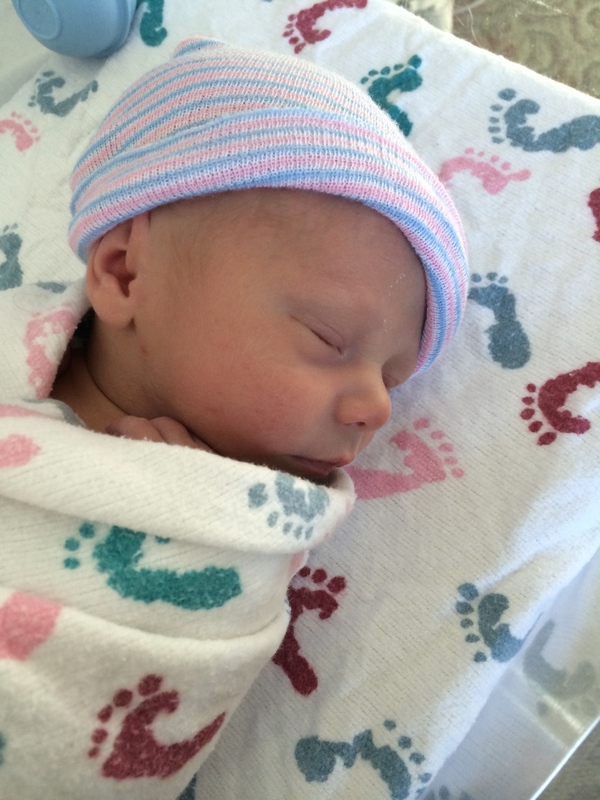 But being “mama” to our sweet boy is more wonderful than I could have hoped for. They say there’s a special bond between mother and son and I believe that must be true. I am just so crazy about him. His personality is much like I always thought it was while I was pregnant with him- hilarious, inquisitive and ever so active. Sometimes the best gifts come wrapped in blankets with tiny feet on them. To celebrate this amazing child, we decided to do an intimate family gathering. My parents were able to fly out from California and Nevada to spend the weekend with us. I’m so thankful for these special times Jonathan gets to spend with his grandparents. I’ve always had such a great relationship with my own grandparents that I feel blessed that Jonathan will get to experience that as well. 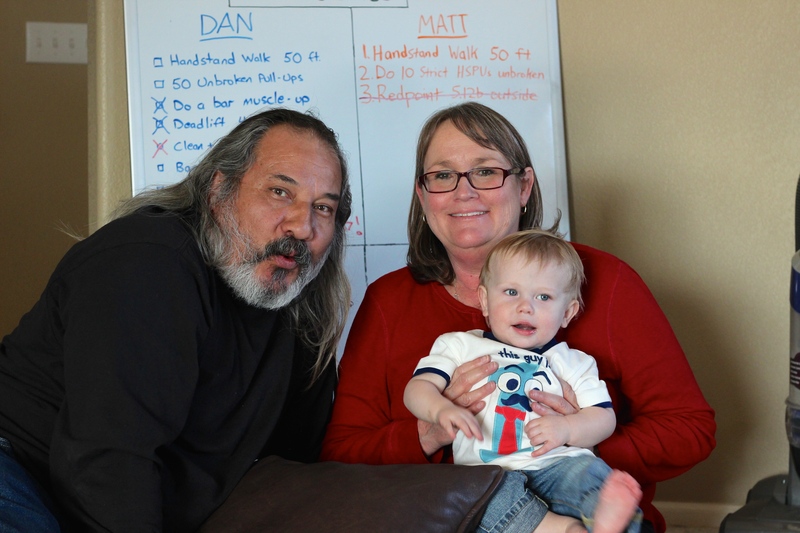 We missed having his Grandma and Grandpa Rabon out this year, but know that we look forward to seeing them in the coming months. We started his morning with Rabon Pancakes. 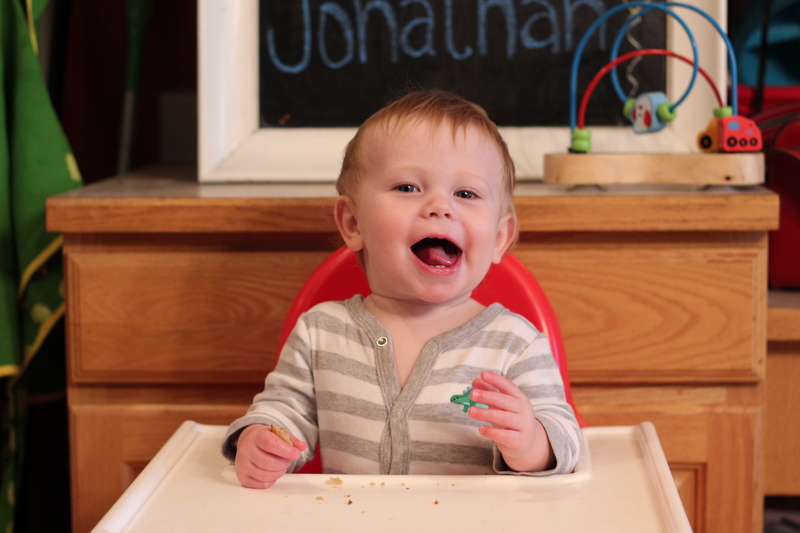 He’s been salivating over pancakes for months, tortured by his inability to consume honey until the age of one. Rabon Pancakes are a recipe that Stephen’s mom has been using for years that are healthier than normal pancakes and primarily sweetened by honey instead of sugar. 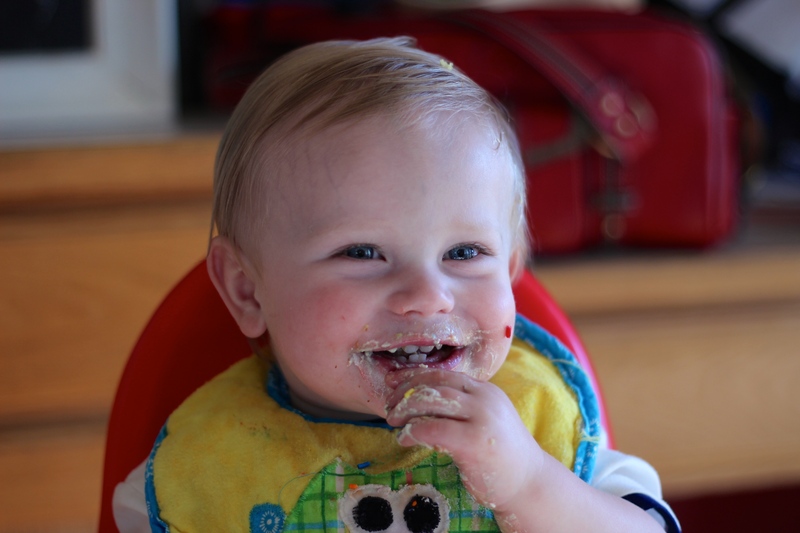 Uncle Matt was sweet enough to make him some pancake batter the night before, knowing that he himself couldn’t consume any while on the Whole30 diet. Jonathan is pretty lucky to have such a sweet uncle. I spent the morning cooking his birthday lunch and baking his cake, so he spent time playing with his dad and sous-chefing for me. My favorite birthday meal has always been tacos, rice and beans, so I thought there could be no better choice for his birthday lunch. 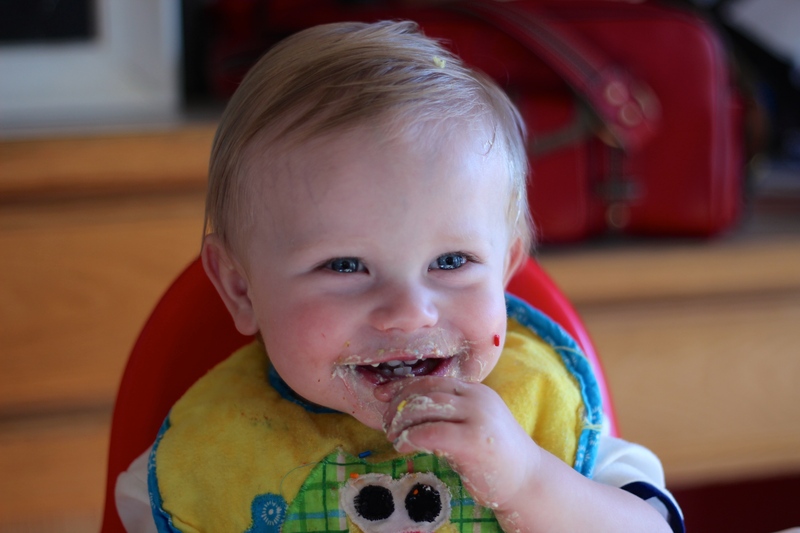 He’s eating more real food now, and is able to use his superb pincer grasp to feed himself. 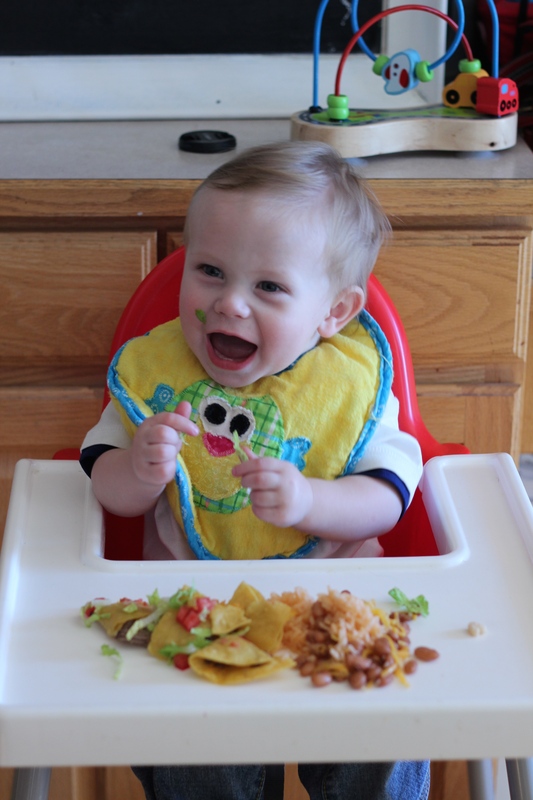 Rice and beans are naturally perfectly sized for him and by “deconstructing” the taco, he was able to enjoy some shredded roast beef, tomatoes, corn tortilla, cheese and lettuce. Mom and Dad were both at the house in time for lunch and Uncle Brandon & Auntie Meghan also came and joined us. It was nice to have a small gathering of people who love him and are close to him. We sat with him and chatted while he ate pieces of his meal. 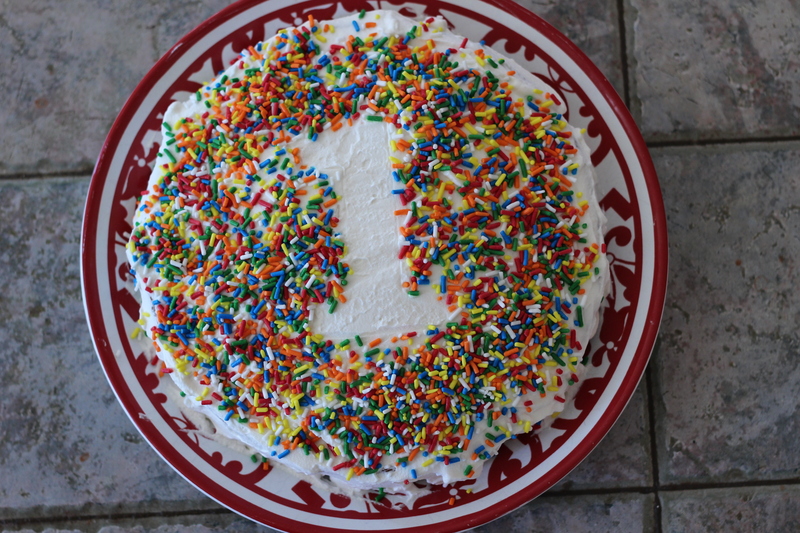 Then, it was cake time. If he were true to his mother’s example, there would have been cake in his hair, ears, and nose. Jonathan, however, is more gentle than I was at his age. 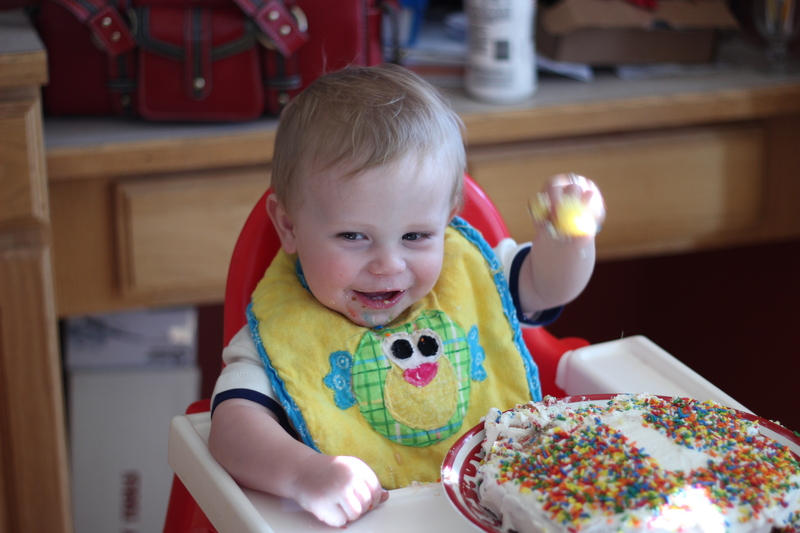 When presented with his birthday smash cake, he proceeded to pick off and eat sprinkles one by one (pincer grasp strikes again). 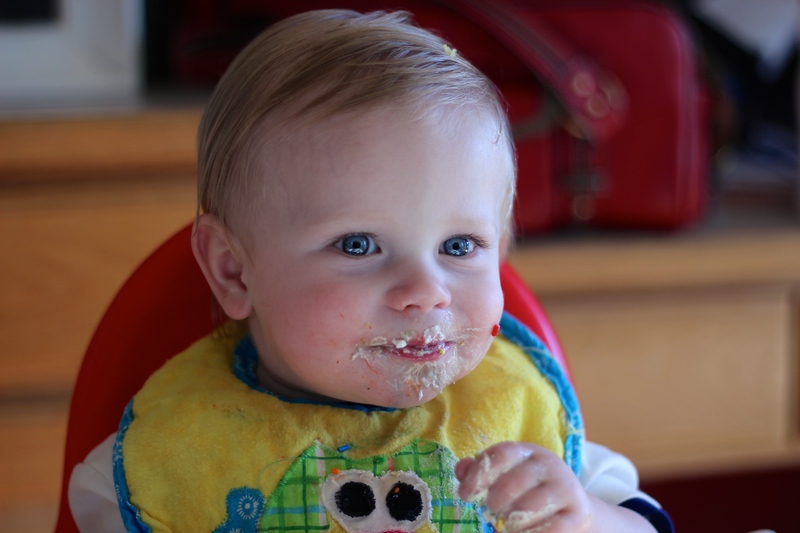 After some examples from his dad on how to dig in, he did eventually go for it. After he had his cake, Uncle Brandon and Auntie Meghan had some other engagements to attend to and he opened his gifts with his dad, Grandpa, Nani and I. He was, of course, very well-loved by our family and friends. 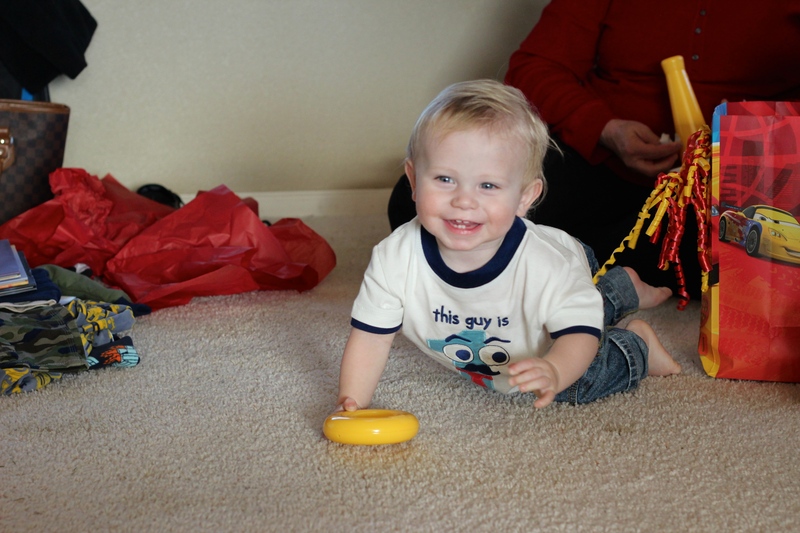 He went from almost no toys before Christmas to having many to choose from now that Christmas and his birthday have come and gone. 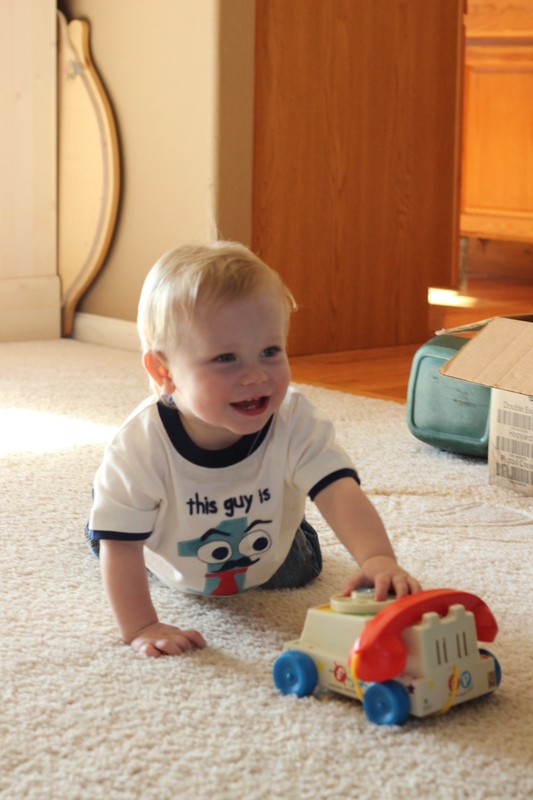 He is enjoying exploring all of his new options and learning new sounds, shapes and colors. He is even learning some Spanish along the way. We spent the rest of the afternoon and evening playing and enjoying each other’s company. He received phone calls, texts and videos from those who love him and even got to Skype for a little while with his Uncle CD and big cousin Slade. In all, we couldn’t have been blessed with a more perfect celebration for our laid-back, fun-loving little guy. 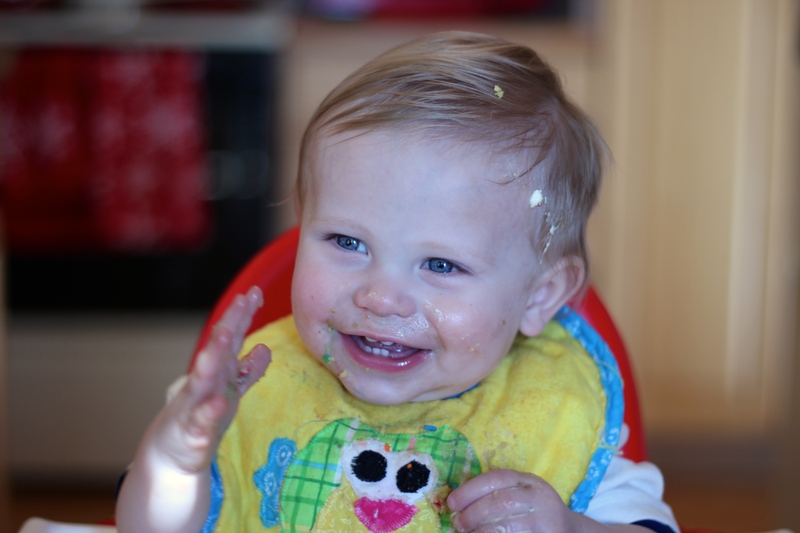 We have his 12 month well-baby check up on Thursday, so be looking forward to a post with his new stats and a new chalkboard! Mommy and Daddy love you, Jonathan Michael. We couldn’t be more blessed, thankful and proud to be your parents. You continue to amaze us each and every day with how sweet, loving, smart, funny and charming you are. Watching you learn and explore the world is exhilarating and we look forward to encouraging you to use your innate curiosity to discover new things every day. God has truly blessed us with you and the story of redemption in our lives that you represent is beautifully unfolding as you grow. God always keeps His promises and has given us the desire of our hearts.